Over the past decade, we have witnessed amazing strides within the area of cosmetic dentistry. TV shows such as ABC’s Extreme Makeover have utilized caps, veneers, implants and dental bleaching to give people an incredible new look. Many people, including a few dentists, got the feeling that dentures were being left behind. For many years, it has been taken for granted that anyone who needs to wear dentures will be forced to endure a life of sacrifice. They would need to sacrifice appearance for comfort, or to live with an unnatural looking smile if they wish to chew effectively. Technology has exploded during the last 20 years, and everything denture-related is now produced to be stronger, more powerful and smaller, all at the same time. Do you remember how cell phones looked when they were first released? They even came with a backpack required to hold the battery. Dentures have not been left behind. Technology has been explored and applied in order to make them stronger, more comfortable and less bulky. Technology also provides us with the ability to completely design an entirely new set of teeth for you, instead of relying on a mold of your old teeth or a general one-size-fits-all replacement. Modern dentures can bring together both strength and style without the need to sacrifice either functionality or comfort. We can offer you a completely unique smile that doesn’t just look natural but feels both comfortable and strong, providing you with the confidence you desire. We will sit down with you in a one-on-one consultation and take you through many examples to create your own personalized set of dentures. As time goes by, the teeth within your dentures, as well as your jawbone and gums, start to wear away and become shorter. Naturally, this can make your face seem shorter as well, giving you an older appearance with more wrinkles. Your new dentures will offset these losses, restoring the correct dimensions to your face. You will be startled at the quantity of change you will see in a short space of time. Those who wear dentures often inform us that due to their old dentures appearing fake they are self-conscious and often hide their smiles. Adding insult to injury, they commonly have difficulty chewing and often feel uncomfortable. 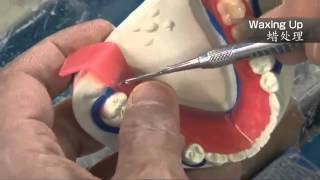 Our cosmetic dentures are hand-crafted according to your very own detailed description, providing you with the most realistic appearance, as well as a level of comfort that you could never have dreamed possible. The possibilities are limitless, you can choose from an enormous range of different sizes, shapes and styles of teeth to suit your personality and appearance. It doesn’t matter if you have lost just a few of your natural teeth or even all of them – never give up hope. 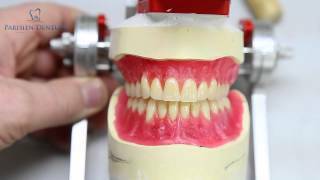 We spend a lot of time talking about the lengths that we go to in order to make certain that the teeth on your denture feel natural and look realistic, but were you aware that we can do exactly the same for your gums? There is no reason for your dentures to have gums that match that shade of Barbie pink that can’t be discovered anywhere within nature. We don’t just choose a gum color that matches your real gums, but we even alter the shade and shape to ensure they look completely realistic. The technology explosion of dentures does not stop with our countless customization abilities; it also aids in our communication. We could chat about the appearance of your dentures until we are blue in the face, but you still wouldn’t see exactly the same picture that we describe to you. However computer imaging technology can actually show you pictures, allowing you to help us with the design. When the ideal design is joined with modern tools for the measurement of your oral and facial structure, we can create a set of dentures that is years ahead of anything you’ve ever worn before.